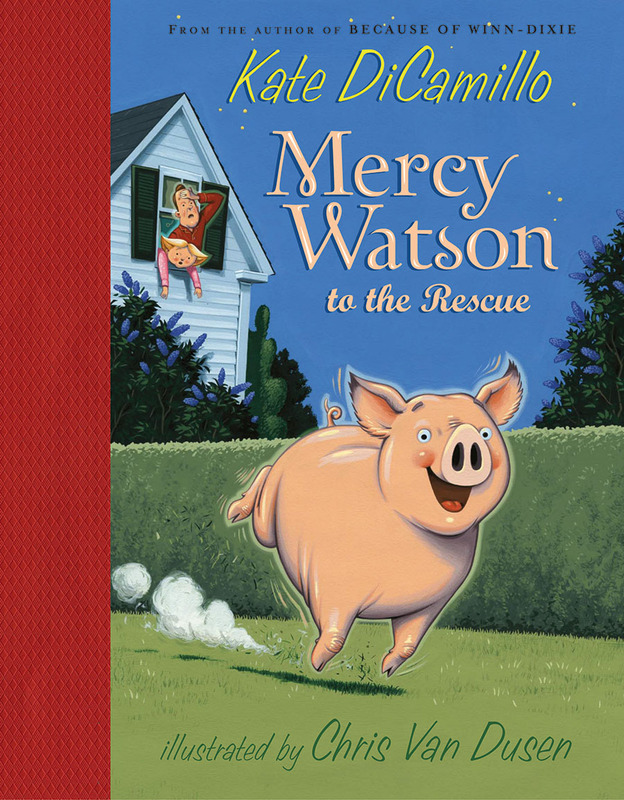 Mercy Watson to the Rescue by Kate Di Camillo (of The Tale of Despereaux fame) and illustrated by Chris Van Dusen is the first of what is currently a six book series centered around the exuberant pig Mercy Watson. Mr. and Mrs. Watson dote on Mercy, extolling her many virtues and proclaiming that she is “a porcine wonder.” This chapter book is such fun to read aloud, with bright, frequent illustrations and madcap humor. Each night the Watsons sing their porcine wonder to sleep in her bedroom, “[t]his song makes Mercy feel warm inside, as if she has just eaten hot toast with a great deal of butter on it.” As you can see, much like another book featuring a beloved pig, Granny Gomez and Jigsaw, Mercy is not a pet but a member of the family. The toast with butter theme is heavily featured in this book and in the subsequent books with sitcom-level regularity. My daughter now asks specifically for Mercy’s favorite food but to her this means rice bread with coconut spread so it is something to be aware of if you are interested in the series. In this book, Mercy decides that because she is scared of being alone in her dark room at night, she will climb into bed with Mr. and Mrs. Watson. The added weight causes the floor to creak and crack until all three Watsons wake up, realizing that if they move the bed could crash through the floor to the downstairs. Mercy runs off the bed in search of something to eat but through a series of outlandish events she inadvertently brings help to the Watsons in the nick of time. My daughter loves this book, it is just dynamic and fun to read together but the details I mentioned above are good to know in advance if you’d like to check the series out. The Watsons dote on Mercy, Eugenia Lincoln complains, there’s often a chase (for Mercy loves a chase), and various peacekeeping forces usually end up involved. Mercy is described on the official website by the author as selfish and oblivious. DiCamillo writes that the Watsons keep seeing Mercy in the best possible light is what she’s “come to believe that that is what love is about: somebody insisting, mercifully, on seeing us better than we truly are.” I think that Mercy’s flaws make her interesting fodder for adventure even though there is a little bit of the cliche about a greedy pig. And aren’t all children, like Mercy, a little oblivious sometimes? Despite the title, I think that the real stars here, however, are Mr. and Mrs. Watson and their unconditional love. These characters are wonderful! I love books that appeal so strongly to children but are also fun for adults to read 🙂 Another fabulous review! It turns out my kid’s teacher chose this story as a class read earlier this year. I haven’t read it but it got a major thumbs up from the early elementary demographic in our home. I’m glad to hear others are enjoying the book, it was a gift from my daughter’s best friend so I had high hopes.